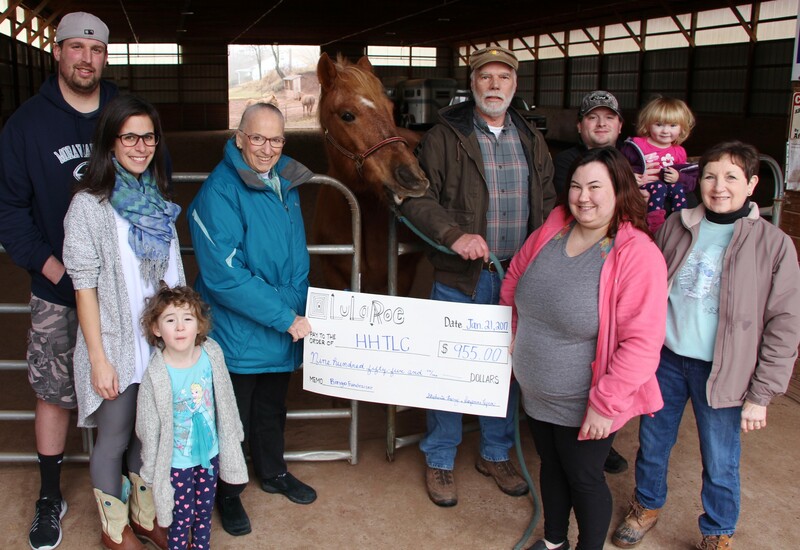 Horses and Horizons Therapeutic Learning Center in West Penn stated their appreciation to one of their own volunteers for raising $955 for the center via a LuLaRoe bingo recently event in Summit Hill. Center volunteer Suzanne Lynn, a LuLaRoe consultant, organized the event this past Sunday at the Summit Hill Heritage Center. Lynn stated her appreciation to all who volunteered and supported the event. From left are Andrew Remsing; Suzanne Lynn, LuLaRoe consultant and HHTLC volunteer; Gia Larry, age 5; Alice Weaver, board president, HHTLC; Frosty, 18-year-old therapy horse; Harvey Smith, Executive Director, HHTLC; Stephanie Larry, LuLaRoe consultant; Chris Larry; Paige Larry, age 2; Elaine Smith, Program Director, HHTLC. HHTLC Executive Director is Harvey Smith. Program Director is Elaine Smith. They’ve been married 43 years.